The RandomForestClassifier is trained using bootstrap aggregation, where each new tree is fit from a bootstrap sample of the training observations . The out-of-bag (OOB) error is the average error for each calculated using predictions from the trees that do not contain in their respective bootstrap sample. 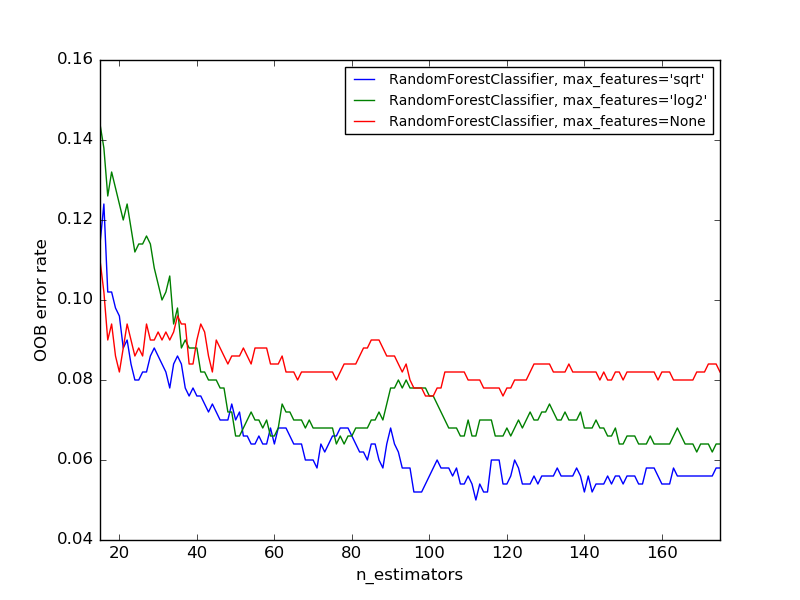 This allows the RandomForestClassifier to be fit and validated whilst being trained . The example below demonstrates how the OOB error can be measured at the addition of each new tree during training. The resulting plot allows a practitioner to approximate a suitable value of n_estimators at which the error stabilizes. T. Hastie, R. Tibshirani and J. Friedman, “Elements of Statistical Learning Ed. 2”, p592-593, Springer, 2009. # Generate a binary classification dataset. # error trajectory during training.